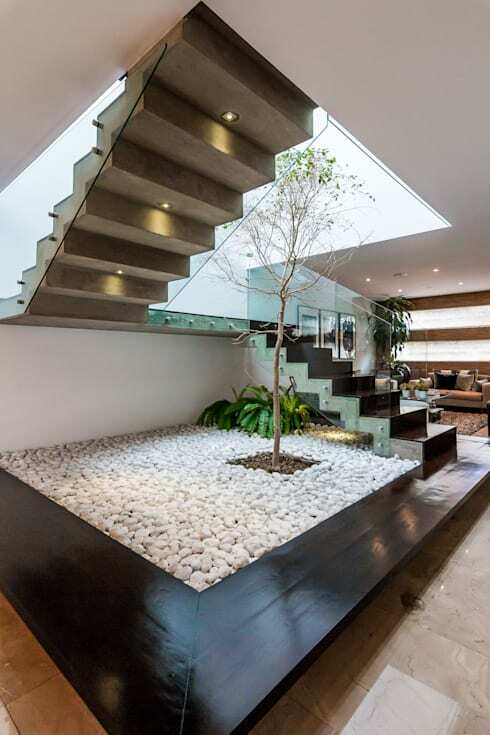 18 staircases with a stone and water garden – spectacular! One of the most overlooked areas when designing a home is the space underneath the stairs, which often ends up being the dumping ground for the entire family. Building libraries or storage cabinets in the space is a great idea when you have a limited area to work with, but if you're lucky enough to have ample space then you can infuse it with life. How? Simply incorporate tons of foliage, fountains and stones to create an aesthetically pleasing environment that is also completely natural. These elements can impart a sense of serenity and peace to your home unlike no other. Join us as we explore some truly creatively-designed stairs in today's ideabook. When you're tuned into nature, you are able to better appreciate the smaller and finer details, perhaps because your senses are more heightened. The dense indoor garden here conveys a sense of peace and works well with the coolness of the stones. By including a sculpture in this space, the concept has been upgraded to the next level! Slightly elevated and framed in wood, the white stone garden here with its singular tree in the middle appears like a majestic vision. 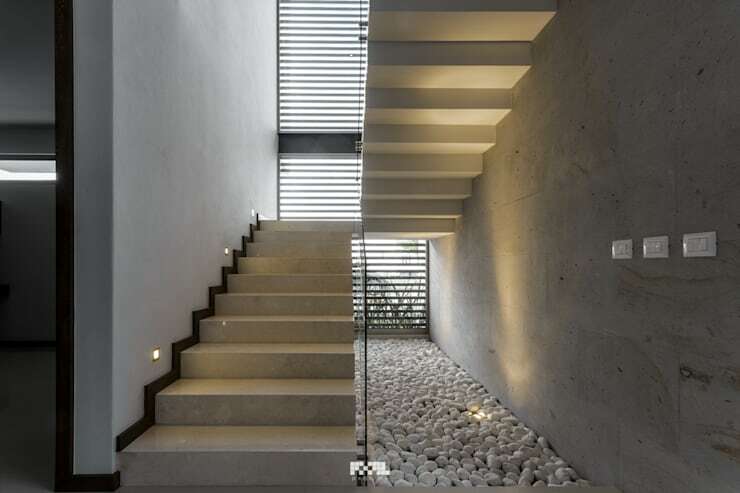 This installation has been merged with the concrete staircase and has a lighting system that increases its attractiveness. A clean profile with glass railings makes it seem almost transparent, allowing the space to appear airier. 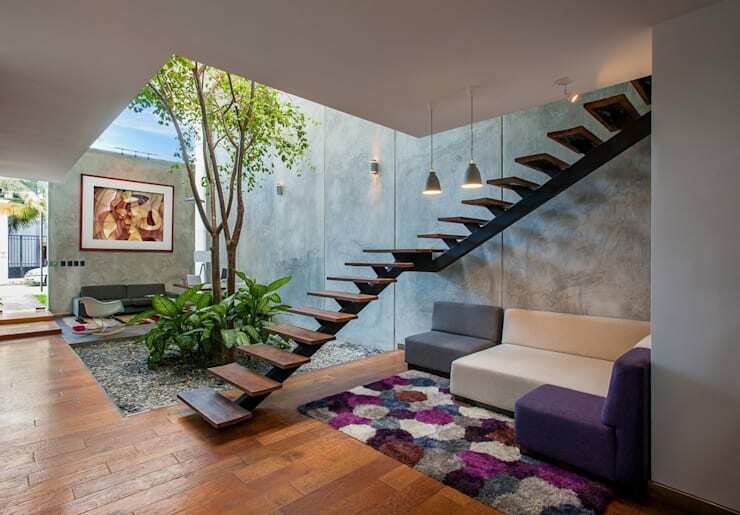 The wooden stairs lends more warmth to the ambience. 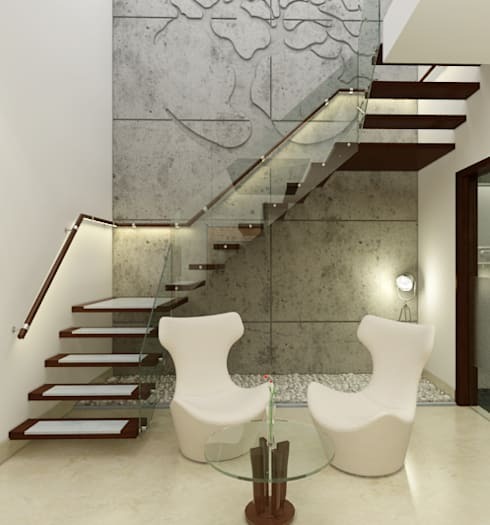 Stone is the key element here – you can see it on the walls, on the floor, and as a carpet adjacent to the staircase. The designers have employed a game of contrasts here, between heavy and light, through the use of the glass balustrade and the metal underneath. The mix and match of materials not only creates an interesting visual element but also ensures that there is plenty of light flowing in through the space. The strength of the wood here contrasts with the lightness of the glass creating a harmonious effect. The white walls and transparent glass creates the illusion of a larger space. But the true showstopper here is of course the artificial garden – where three delicately-placed circles signal the stair of the staircase, and where the combination of the pebbles and the marble gives a unique touch to the whole affair. Indoor plants and trees usually need minimal watering, are well-suited to most climes and remain in perfect condition (if taken care of!) for years. Although most don't require a ton of natural light, it is often better to ensure that they get at least a minimum of 1-2 hours of even indirect sunlight in a day. Certain indoor plants can grow to great heights and can be a spectacular addition to your home, if space allows. We can see what it would look like in this elegant design with the tree in the foreground! For a subtle rustic touch, this is the ideal choice. 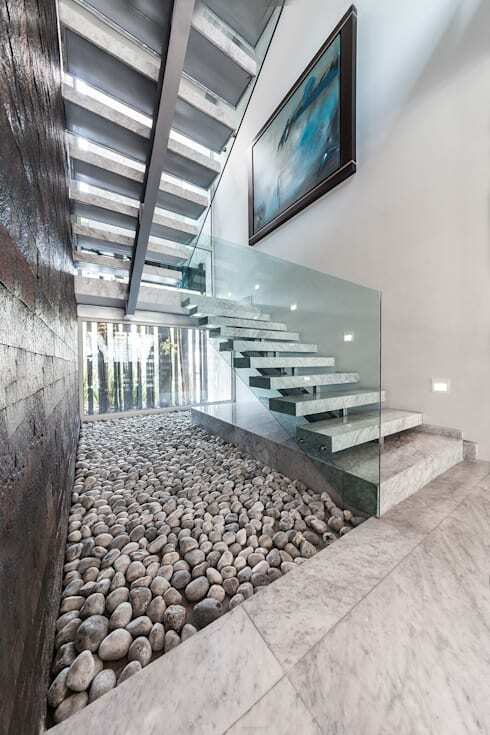 The stone garden behind the stairs buoys up the space while adding to the textural elements. The plants seen here remains green in any season and are a great choice for indoor plants. 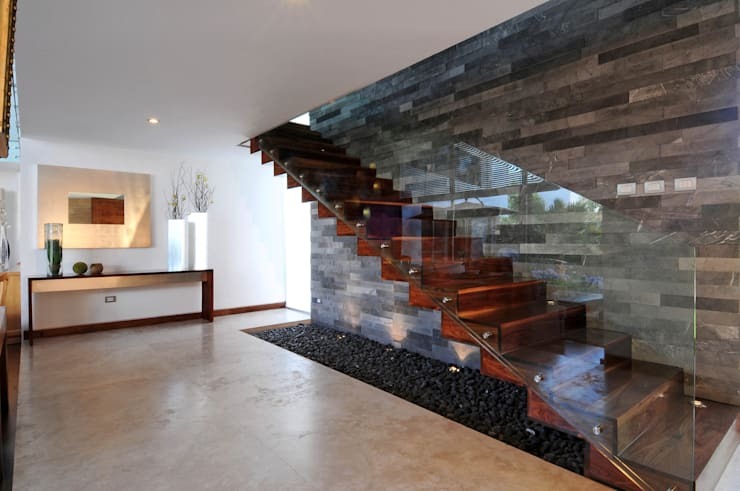 This is a perfect modern staircase with hints of tradition. If you have a modern house and want it to look elegant and sophisticated, you can never go wrong with wood. Complementing it with the right materials and elements can make all the difference. 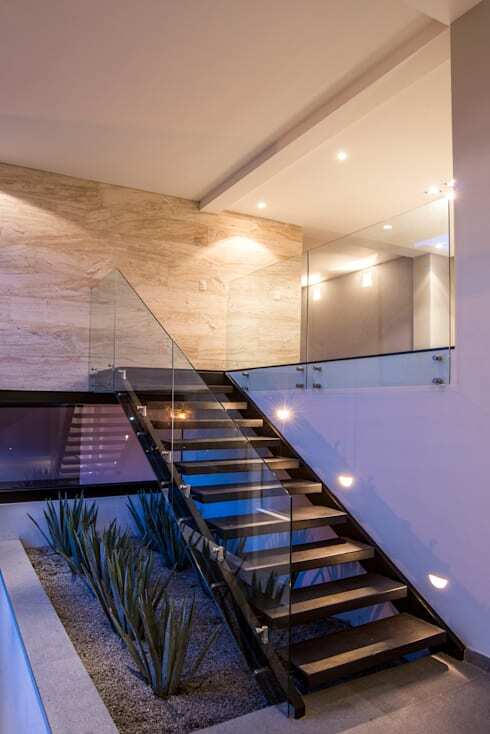 Here, the glass railing keeps the space airy and fluid while perfectly complementing the strength of the wood. But it is the 'dead' space that has been converted into a decorative garden with earthy, serene tones that takes centerstage here. In this elegant interior garden design, we find this beautiful fountain that creates a reflective surface out of the falling water filling it with spaciousness and lightness. 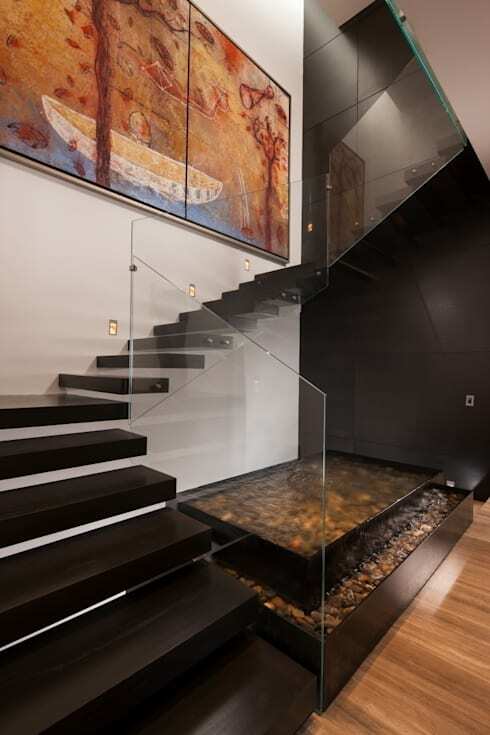 Playing with glass railing and wooden stairs, the water becomes the ornament here that magnifies the beauty of this space. Lightweight materials that are ideal for modern spaces have been given predominance here. Don't these stunning stairs look like an art installation? 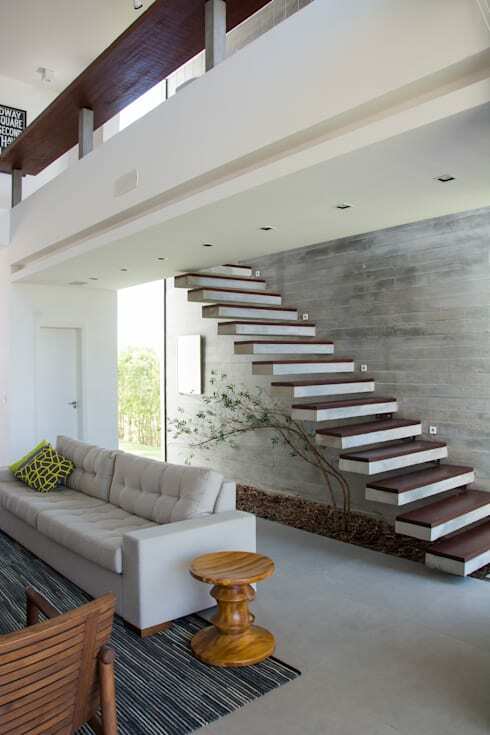 Floating and almost ethereal, the stairs here have been attached to the wall where the wood seamlessly blends in with the concrete surface. 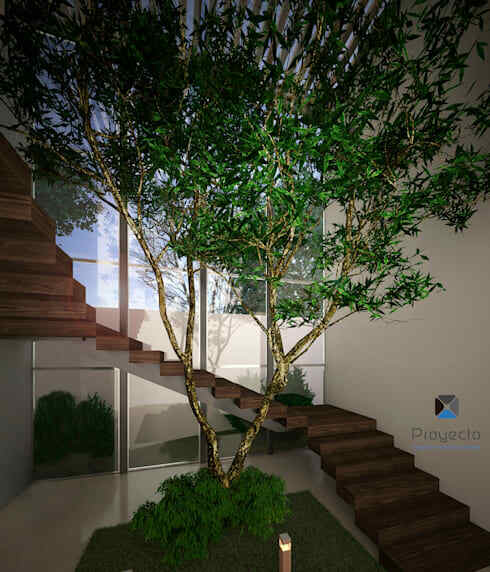 Once again, we can see how the space under the stairs have been put to good use – a minimalist garden becomes the icing on the cake of this wonderful home. If you're a fan of traditional design, wrought-iron staircases moulded into different designs (flowers, diamonds, birds you name it!) are a great idea for creating a sophisticated and old-world feel. 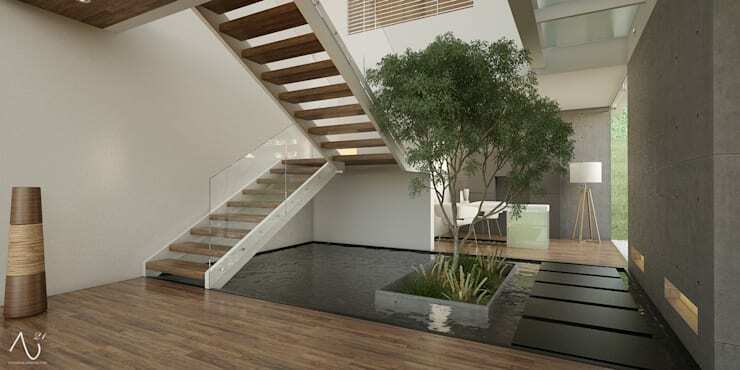 If you combine elements such as water or a miniature garden underneath the stairs, the result is sure to be outstanding. 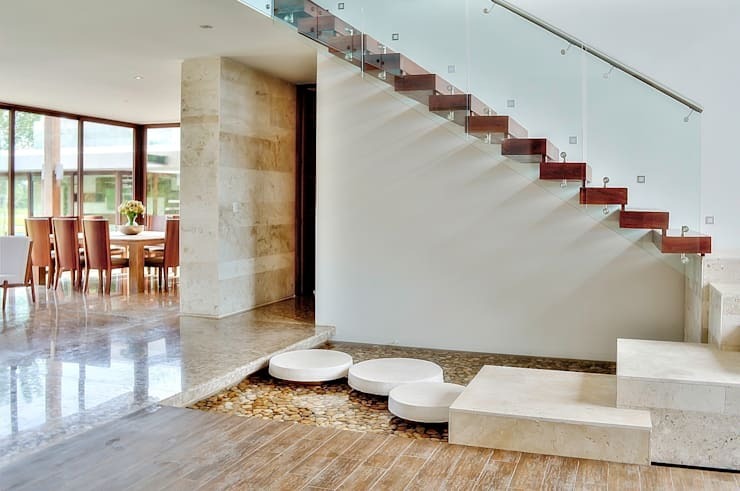 Floating stairs are a great aesthetic choice when it comes to decorating a house – although it's perhaps not the most practical option if you have children or elderly people at home! The design here recalls to mind a grown-up version of a treehouse what with its precarious-looking stairs and the beauty of nature it's surrounded by. The cheerful palette adds a dose of freshness to the whole space. In a space where earthy tones prevail, the presence of that lovely fireplace bumps up that cosy feeling. 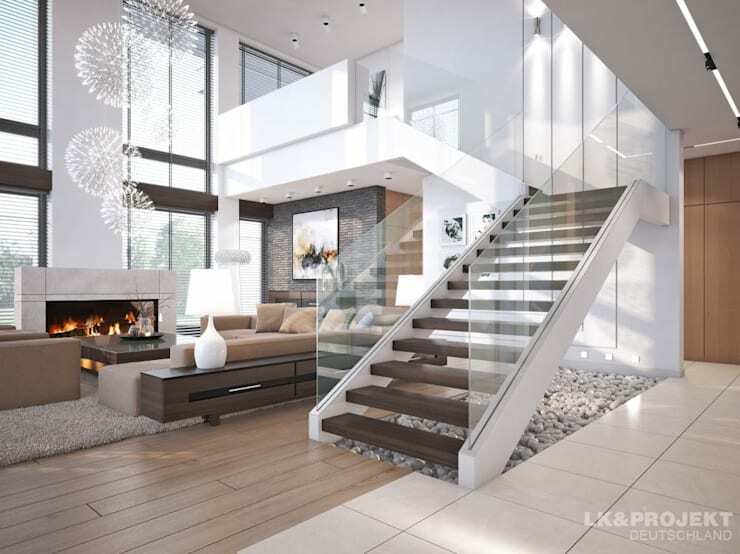 Making this whole space even more distinguished is that staircase with its clear lines and transparent balustrade and the combination of wood and glass. Taking it up a notch is the stone bed behind the stairs, which gives the whole space a refined air. 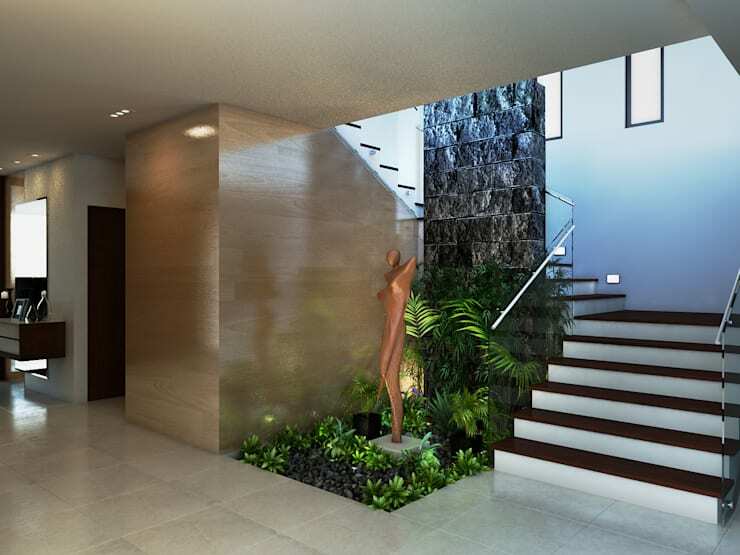 The stone on the wall along the narrow bed of volcanic rock underneath the reddish-hued stairs takes this design to another level of sophistication and modernity. Each items holds its own weight but thanks to the glass, seems to be lightweight. 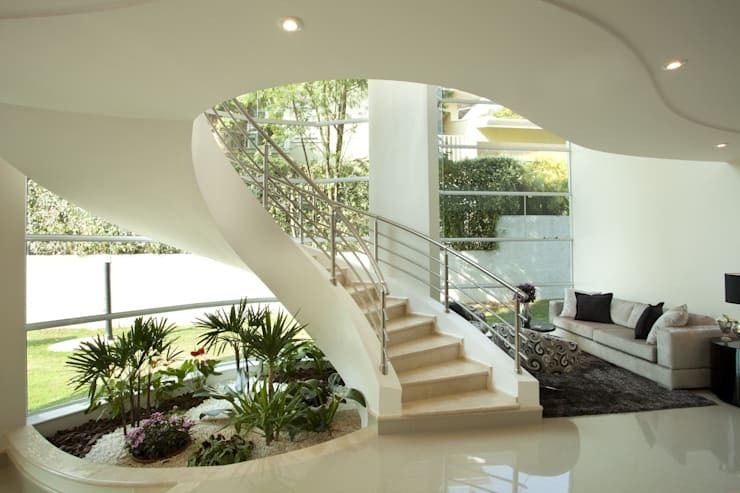 The tones chosen make the staircase and the garden the focal point here. Few sounds are as relaxing as those of a cascading waterfall – its continuous movement signifies natural energy and does the heavy-lifting job of purifying the environment. 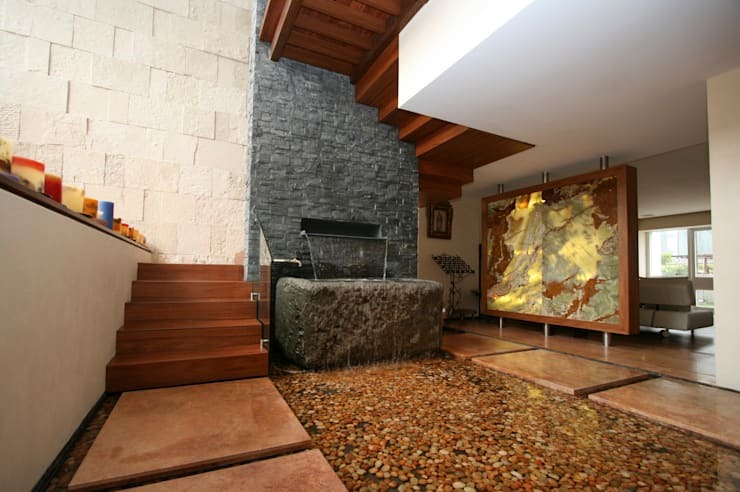 Here, the spectacular stone basin and waterfall becomes the focal point of this entire space, which mixes and matches a ton of different natural materials – you can see wood on the stairs, marble on the flooring and of course the stone bed. There is something about spiral staircases – it has a beautiful and enigmatic air to it unlike no other. Here, the designers have incorporated the golden ratio or golden section, seen usually in great works of art. The golden ratio is a mathematical ratio found in nature that can be used to create natural-looking compositions in design. 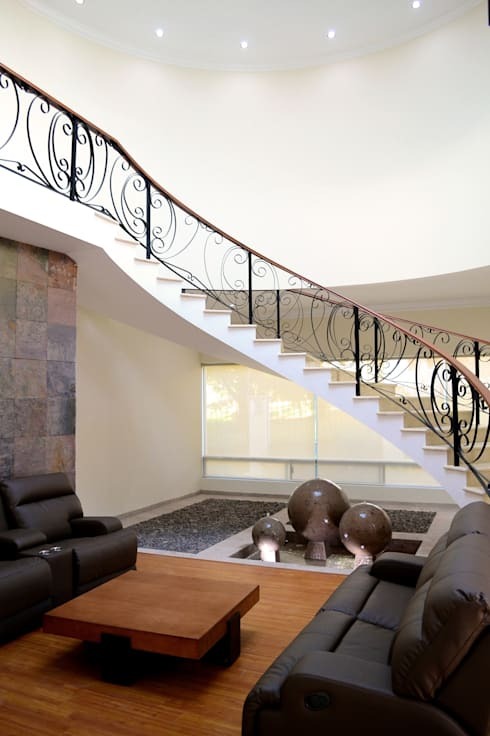 The charm of the stairs here is that it merges with the ceiling, creating a kind of monumental sculpture . The garden underneath emphasises the organic feel of this space. 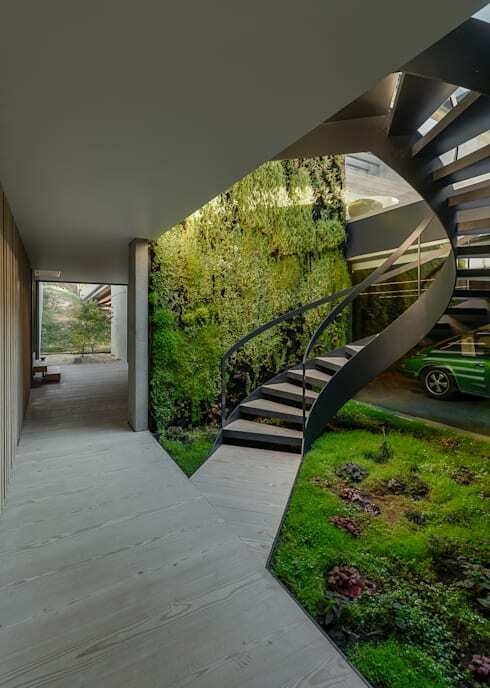 A rather unique way to design a spectacular staircase, as can be seen in this image, is by incorporating a gorgeous green wall brimming forth with vegetation. Does that look like it's straight out of the Lord of the Rings or what! Green walls are a great way to bring nature indoors, especially when you don't have a lot of space. They are also an opportunity to impart an original touch to the decor of your home. Choosing the right lighting is critical when it comes to designing your home, as it intensely affects our mood and perception of a space. It imparts warmth while also highlighting certain details and finishings of the house. This simple staircase whose only ornamentation is the long stone bed adjacent to it, is given life thanks to the strategically-placed lighting that highlights the textures of the materials used. When designing a home, we often visualise a small space where we can relax or entertain guests. We don't think of this space as occupying the area near the staircase, but the question this image is clearly asking is – Why not? The architects here have transformed the empty space into a lovely little hangout spot. The white, sober tones offer elegance and sophistication and are a great source of inspiration. Check out 13 fabulous home entrance ideas for small houses.